Alan & JC are two of the most amazing people in the world. When we see a picture of them meeting in real life, years after they met on Living With Ataxia, it’s deeply inspiring. 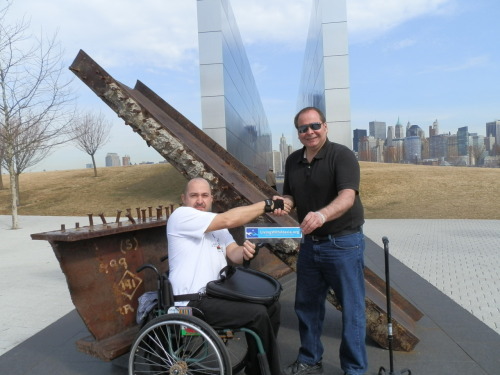 Global Meeting of 2 Ataxians, Alan Thomas and John “JC” Colyer, at the “Empty Skies” 9/11 memorial at Liberty State Park in Jersey City, NJ in March, 2012. Alan hold a trabasack leaflet up, what a good chap!